Cincinnati never ceases to amaze me. There is always something new to see, do and learn. Rich in history, one area of Cincinnati that has gone through a reawakening is Over-the-Rhine (OTR). OTR is filled with boutique shops, excellent dining (Taste of Belgium, Senate, Lavomatic to name a few), great venues for live performances (The Ensemble Theatre of Cincinnati, the Know Theatre and Cincinnati Music Hall) plus you can find the School for Creative of Performing Arts, the Art Academy of Cincinnati and the Pendleton Arts Center in the neighborhood. It is also home to the historic Findlay Market. I love seeing the older buildings showcasing all of their architectural splendor. Recently, I was able to appreciate OTR even more thanks to an invitation from 365 Cincinnati.com to attend the Spirit of Christmas tour (part of American Legacy Tours). We met at the Cincy Haus (a great store located in the heart of the Gateway District filled with Cincinnati prints, memorabilia and gifts). Our journey began with our festively dressed tour guides explaining what we would be doing on our 2 hour walk through OTR. 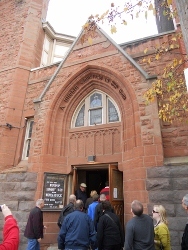 The Spirit of Christmas is a tour of some of the historic churches in the area. I never knew there were so many in one section of the city and we didn’t even visit them all. We got to go inside five historic churches. All but one of these churches are still functioning parishes who do so much to support those in the area and especially those in need. One church, Prince of Peace Lutheran Church, only has eight members but they still make a positive difference in the lives of many by providing clothing, a drop in center for the homeless during the cold winter months and a weekly meal on Wednesdays. Even though their resources may be limited, the true spirit of Christmas is alive in these places of worship. Pictures definitely speak louder than words sometimes, so check out my slideshow of the sites we saw. 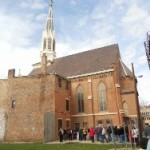 First Lutheran Church – 1208 Race St. – We got to tour the top level of the church and ring the church bell. They had a beautiful organ and some interesting facts on how they made more room in the church. They take clothing donations for their Clothing Closet, provide a community lunch program on the last Monday of the month, & provide a food pantry to help those in need. 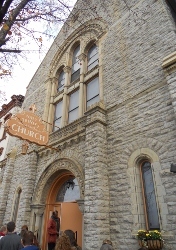 Nast Trinity United Methodist Church – 1310 Race St. – The sanctuary is on the second level of the church and the first level is open to a large community room where they offer weekly Sunday meals for those in the area. 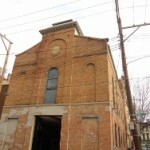 Church undergoing restoration to be a residence. Originally located on a street named Bremen St., it was renamed Republic St. On these old historic buildings the street names were actually located on the buildings. 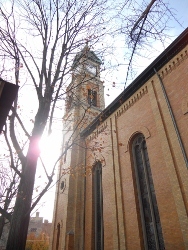 Prince of Peace Lutheran Church – 1528 Race St. This church is at least 100 years old. They now worship in their lower level community room. The original church sanctuary was amazing to see. It is in need of lots of restoration but you could see how beautiful it once was. The large stained glass windows are gorgeous and the organ in the balcony was something to see. With only 8 members, this congregation still does so much for the local community. St. Francis Seraph and Friary – 1615 Vine St. – The church sanctuary was beautiful with a large altar area. Mass is open to all and they are very welcoming. St. Francis also runs a school, helps women in the community through the Seraph Center, has a soup kitchen, provides a “Day Laborer Lunch Bag Program” and more. (More on St. Francis at the end of the post). 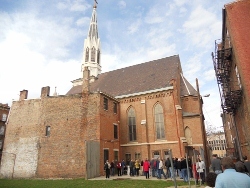 The tour is filled with lots of interesting facts about Over-the-Rhine too. If I’m recalling correctly, our guide remarked that this area of Cincinnati was once the second most populated area of the United States housing over 48,000 people within its borders. 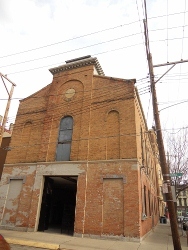 This area of Cincinnati holds such a strong history that it was named on the National Register of Historic Places . The area was once filled with German immigrants and many of the buildings were built by German laborers. 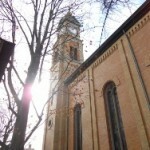 For more Over-the-Rhine history, check out iRhine.com or visit Over-the-Rhine Chamber of Commerce to learn more about their revitalization efforts. The Spirit of Christmas only has three tour dates left in December so if you get a chance, book your tour soon. The remaining dates are Dec. 3, 10 & 17 at 11am. Adults are $20 and kids 16 and under are free if you bring 2 canned goods to donate ($5 without the donation). Although, children are welcomed on this tour and we did have a few on our journey, I would caution you that it is a walking tour and it lasts at least 2 hours. Seeing all the buildings and listening to our informative tour guides definitely kept me engaged but younger children may loose a little patience after a while. Of course, if they can hold out for the last church on the tour, they will be pleasantly surprised. I’ve driven by St. Francis Seraph & Friary many times but I’ve never set foot inside. We were welcomed by Brother Tim at their outdoor nativity complete with stables filled with the sweetest live goats and sheep. Brother Tim also welcomed all of us into the Friary and shared some of its history. It was an honor to enter the first level of St. Francis and see the beautiful displays of creches from all over the world as well as to enjoy their festive Santa room, and the dining hall had the most amazing miniature Charles Dickens Christmas village. There was also a courtyard with a working train. Even it you can’t make it on one of the tours, you can still visit the outdoor nativity and stable. It will be open daily through Jan. 6 from 1-7pm. But, if you want to go into the inner sanctum and see the amazing creche’s then book your tour for the Spirit of Christmas. This is one of the most worthwhile things I have experienced in Cincinnati and would highly recommend American Legacy Tours. 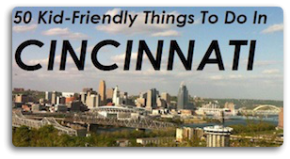 They also have a variety of other tours to choose from too (Newport Ganster Tour, Queen City Underground, & Civil War Cincinnati). Disclaimer: I was given two free tickets to go on the tour thanks to our friends at 365Cincinnati.com and the American Legacy Tours. Thanks to everyone who entered The Spirit of Christmas giveaway. Our winner was Ryshel. We’ll contact you via email. I subscribe to your eNewsletter! I am already a fan on facebook and a subscriber to the newsletter. I posted in the forum about FFC giveaways. I joined the community forum! Although I am a history buff and think the Civil War tour would be awesome, I really think the Gangster Tour would be interesting! I left a comment on The Queen City Underground page! f) I looked at the Tours they offer and I’m interested in all of them, especially the Gangster Tour! I’m a fan of FFC on facebook! I was surprised at all the other tours ALT offers. I would like to give The Spirit of Christmas tour to my in-laws as a gift. I think they would really enjoy seeing all the churches and be surprised they still exist.